← An Apologist for Christian Capitalism: Charles Sligh Jr. This interview is re-posted from the Sept/Oct. 1996 issue of the FUNdamentalist, an independent newspaper that existed in Grand Rapids in the 1990s. This interview was with Fr. Dennis Morrow, a Catholic priest who has done slide shows for the Grand Rapids Historical Society on the impact that highway construction had on Grand Rapids in the 1950s and 1960s. Jeff – Could you give us a summary of the presentation you give on the impact of highway construction through Grand Rapids? Dennis – The title of the presentation was “Lost Grand Rapids: Under the Freeway.” The idea was to display photos of buildings that have not been around for 30-35 years now, some commercial structures, some railroad affiliated buildings, but primarily residential structures that were removed with the building of the freeways. There were 70 some slides that we selected from roughly 200 that I had culled from the library’s collection. We made slides from these and put on a show. It had a commentary in it with each photo to kind of say who lived there and who built the house. That was for history buffs, because of some of the old limestone buildings along the river front, but I couldn’t resist putting in my own 2 cents at the beginning about something that I really think should be done, and fairly soon, because the people who remember the building of the freeways and the people who were displaced are little by little dying off. The people who were old when they had to move are gone. It is primarily people my age and younger who remember things. The reason I say there should be a study is that I have never seen a good sociological study of the effects of urban displacement that took place from the mid-1950’s to the mid-1960’s. A lot of people point to the unrest of the 1960’s as a reaction to all kinds of things; the slowness of desegregation and the Kennedy assassination and the subsequent assassinations of King and Robert Kennedy. But I would be very interested to see some tracking done of that time, because I think there is a correlation between people who have been displaced or a community which can experience itself to have been raped. This is really what freeways did…..physically. They literally raped cities. This was not to Eisenhower’s credit, as I understand it, with the Interstate system. Eisenhower surely saw the advantage of connecting cities, but it was not part of his plan to disrupt cities and to gut them in some cases. Grand Rapids suffered minimally in all that compared to other cities. Look at Detroit, the devastation that occurred there when the highway was built. We don’t normally call it devastation, because something was built. It was pushed through by the government and certainly you could say that some people have benefitted from it. However, if the devastation from the riots of the 60’s had been nearly as great as the devastation wrought by the freeway construction they would have called the riots an all out war. The amount of dwellings that were destroyed during the riots were infinitesimal compared to those destroyed during the freeway construction. 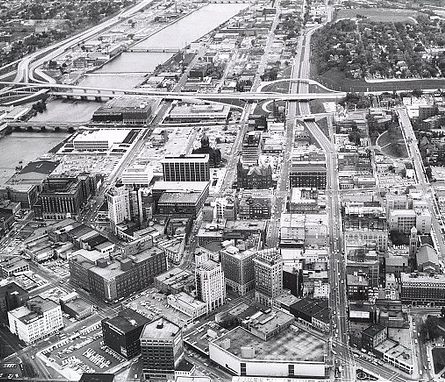 You can look at virtually any city that where the freeway went through, the older housing stock, everything around the freeway became undesirable as a place to live. There were lies. I went to visit a lady in our parish (St. Peter & Paul) who recently moved off the 1500 block of Turner, because I wanted to find out what happened back then. My family was on Front Avenue and we lost our home to urban renewal a year after the freeway was built. We knew so many people that were uprooted and displaced. So, this lady told me that their house wasn’t being taken, but most of their neighbors had to move. This man from the State Highway Department came and told her that you are going to love this. It will be tree lined all along the road. In fact, it will seem like you are living on a boulevard. I asked her if that man bought the house next door, if it was going to be such a wonderful place to live. I don’t think anybody who lives next to or near the freeway considers that to be a really nice place to raise children. We have since seen the value of housing diminish along with other devastation. Devastation in this sense: that it made the housing undesirable in people’s minds for a family thinking about moving there and raising children. So the people who were left there were often people who could not afford to live anywhere else. Jeff – Last year I did an article on the residents who lost their homes on the westside near the highway because of the parking lot that was being put in. One person I spoke with, Tom Kroon, who still lives there, he told me that the neighborhood did not become run down in any way significant until the highway went in. I wonder with your investigation on this matter if that would be a fair assessment? Dennis – The neighborhood was old. We lived at 8th and Front and we had neighbors of all kinds. We didn’t have rich neighbors, but there were all kinds of people. The were old people, younger couples, apartment dwellers, quite a mix, but cohesive in a way. Sure Front Avenue was a major thoroughfare in those days, but people never really assigned a value to their house. It was where we lived. So what if you lived across from the old Leonard St. market, it was no big deal. I can say for a fact that my Grandparents never wold have moved out of that house. It had no hot running water and no bath tub. They used the old laundry tub for baths. They never had any desire to put them in. So I guess I would think of a neighborhood down there on Summer and Mt. Vernon to be a great deal like the neighborhood I grew up in. There were some families that were well to do. In the slide show I did there was a photo of the old Jackoboice homestead at Mt. vernon and Allen. It was a nice old brick home. So if you recall some of those houses on Mt. Vernon and Tom’s house on Summer, some of them were really magnificent homes. Like Heritage Hill that had been over the years chopped up into apartments and things like that. That to me is a zoning problem, which done properly could have prevented some of the things from happening to those houses that did. So you have 6 or 8 units in a home that was designed for a family, you over tax the property and it gets run down and in effect it takes its toll on the people in those dwellings. Let’s go back to the sociological displacement that I was talking about before. When I think of the wrenching of friendships and neighborhoods, of people who had lived there for a long time. My Grandfather had lived on 8th and Front since 1919, when they moved there from Illinois. His parents both died in that house and the house was eventually torn down at the end of 1961. So, for 42 years that was his home. Well, when you just come along and bat it down you deal with the same kind of anomie, in a way, with the effects of a major war. It is possible that some of the highway planners had just got back from the war and so devastation in Europe and the thought of it didn’t bother them. Things like tearing down homes, cleaning things out, tearing down buildings, but they went about it with a zeal. 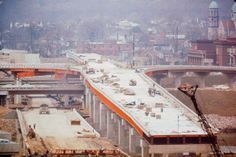 It was not originally the plan of the Interstate system as I understood it, but many of the urban planners saw this as an opportunity to clean out some of the undesirable areas. Jeff – It seems to me that this situation continues with the types of things they are doing, especially in the downtown area with parking and roads and some of the new construction going on. How important is long-term planning when it comes to designing cities that are more people friendly? Dennis – I think planning is very important, because left to ourselves we tend to take the easy way out. I have to consciously say to myself that, no I’m not going to use my car today, because I don’t have to make all kinds of stops along the way. All I have to do is go downtown and go back. If it is a cold, blustery winter day, then I can plan to take the bus. That’s personal planning, but I think that the City government can encourage people to do that. That is a legitimate role of government. Simply planning for people’s convenience is not the way to go. Look at big malls, which have a lot of space, they planned around people’s convenience. Look at the example of the City of Walker right now. They have an opportunity to plan and to say no. They already have those huge malls on Alpine Avenue. They have space in Alpine Township just north of 4 Mile where these stores have come in and torn up the orchards, paved over that green space and now they are empty, because there are too many malls already. And then they still want to do this with even more farm land…..come on! So the more that you do this in the outskirts of the city the more downtown is going to be in a frenzy of just to figure out where people are going to park. Then you get the level of bus riders like in the 1960’s, where it dropped so much that they discontinued bus service at night. Then we wonder why we have social problems on the street. People can not get to jobs unless they have a car and most are not willing to pay for a cab, because it takes up most of their salary. Another problem is that this aspect is only seen as a problem for the poor. Rich kids can always have access to a car. I mean look at Catholic Central. I think it is atrocious that Catholic Central even has a parking lot. These kids have no business taking a car to school. Why can’t they take the bus? I don’t see any reason for that at all. So, yes, planning is very important, but it needs to be drummed home to people. Sort of like what has been done with recycling. It took years but now it is fairly common. We have to do that with public transportation. People need to see that it can be an effective and efficient way of getting around. Jeff – One other thing that comes to mind as you are talking is that people generally approach this from one angle. they say that we should build this because it will create jobs, or we should take this building down because it will free up more parking space or we need to bring people downtown. When dealing with any of these issues we need to look at it in the larger picture and see how it effects us on all levels. We need to take a more sociological approach, as you say. How does this stuff affect people emotionally, how does it help create community, create job security or safer neighborhoods. It seems to me that this type of thinking doesn’t exist in present planning for the most part. Dennis – I think that should definitely be addressed, but there are fine lines here. It is very difficult to tell somebody what to do with their property and we really don’t want that kind of government interference. However, when people come together, like they did in Heritage Hill, good planning can happen. They had a wide range of people who got together to contribute different things and were able to accomplish some good things without significantly altering the neighborhood. So, we have some success stories, but you have to remember that in the 1950’s there were no neighborhood organizations. The press just announced the new freeway and if you lived in its path, too bad for you sucker. Now if they tried to do that today they would never would have been allowed to do that to the westside because of the historic preservation laws. There were just too many truly historic structures there that wet pretty far back. So, it was an interesting thing to do this presentation from the stand point of what we lost in terms of what buildings that were put up by the pioneers of European descent, which is just a further reflection of what was lost. When those pioneers came here in the 1850’s they cut down all the Indian mounds along the river. That too was devastating and unsettling, then look at what happened to Native people. So, I guess what I am saying is that I look at that displacement and then look at this society or this city, which is suffering in a way that they were not in the mid 50’s. This is not to say that there weren’t degrading housing conditions, there were. But even where there were, people seem to somehow respond in a more wholesome way than they do today. Jeff – What exactly was the time period that this happened, when they decided to build the highway? Dennis – They were already talking about it as early as 1949. I should add this though, I can remember what traffic was like before the highway went in. There was just a sea of cars on Century and Ionia. So it was a legitimate question to ask if the freeway improved the quality of life. The planning in my estimation was just bad. In 1949 there was a plan that I came across in the newspaper. In the plan the route was pretty much the same up until Grandville Avenue, then it cut north right to the east end of the Fulton St. bridge and actually went over the river up north of Michigan. Then it cut back and took the railroad right of the way all the way of north. It would have saved all kinds of houses and everything else. It skirted the downtown area with the commercial development. Whether or not it would have been feasible to build such a monstrosity over the river, it probably would have ruined the river. So, ultimately they decided on the route we have and made it terrestrial. They started talking about the route in 1956 or 57 and then started buying up property. Jeff – So when did the freeway open? 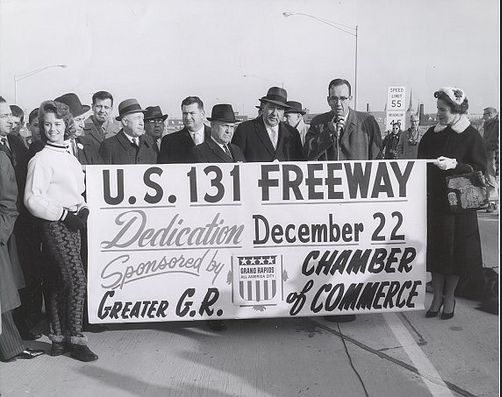 Dennis – US 131 opened in 1962 at a section at a time. It was opened just to Pearl for a couple of years. The East-West freeway opened later. It was completed only in 1964. Jeff – If you had to make a guess, how many houses were destroyed in the construction of both highways? Dennis – I am going to estimate about upwards of about 1,000. I read something somewhere about 4,000 people being displaced. There is a list at the library of how many demolition permits were granted in those years, but I don’t remember the figures. Jeff – One last thing I guess is that considering the decisions that are being made now with the off-ramp that is supposedly needed for the arena traffic and the South Belt, which may free up some traffic to some degree, unless effective mass transit is not included in all this planning are we are just destined to repeat the same mistakes that you have been talking about? Dennis – Yes. You have all kinds of traffic jams all over the city at certain times of the day and then you get on the bus and there are 7 people on the bus. I notice also that people in the cars are generally quite angry with people and swearing at each other. I think driving makes people ornery. In 1989, I spent some time in Navaho country and people just seemed to be so much more laid back. When I got back I felt like a rabbit being thrown into a swarm of killer bees. I come up next to somebody and nod and, geeze, they just look at you. So, I think that driving makes people mean. What I find enjoyable about riding the bus is that people are asking questions and yakking, almost like a barber shop. You can not call it much of a cross section of people. If you go to Washington or Chicago, you see people in business suits riding the bus, you never see that here. People have it drummed into their minds that buses are for poor people. I am afraid if the image isn’t helped to change with planning and publicity, I’m afraid of a chance for a millage, because the poor are often the ones who are not voting. So, for those who don’t ride the bus, they tend to have this attitude that they won’t vote for a buss millage because it doesn’t effect them, but it does. It effects us all eventually. We really need some leadership in the community on this matter. All of these downtown institutions, like GVSU and GRCC. And the City needs to change its position on these matters. We need to have night time buses. I mean the last time I checked it would cost $300,000 to run four main routes at night. This would allow 2 shifts of workers to get there and back that can not right now.And if you took the money just from the parking surveys done downtown you could fund much of the mass transit. We can’t get discouraged however, we need to keep fighting for these changes. This entry was posted in Neighborhood organizing and tagged freeway construction through grand rapids, houses destroyed during freeway construction in grand rapids, people displaced from freeway construction in grand rapids. Bookmark the permalink.